Home / Gaelbhratach / News / Is fiú agus is féidir! Is fiú agus is féidir! Bhí an lá ag an nGaeilge i gColáiste Muire le déanaí! Thuas tá Ms Crean-Lynch ó roinn na Gaeilge le lucht na hidirbhliana agus iad ag iarraidh Gaeilge a labhairt ar feadh 24 uair a chloig! Thosaigh an lá le bricfeasta Gaelach agus lean sé ar aghaidh lena lán imeachtaí eile ar nós réiteoireachta trí mheán na Gaeilge agus Tráth na gCeist. Bhí rannpháiríocht le sonrú go soiléir i bpobal na scoile ar feadh an lae. 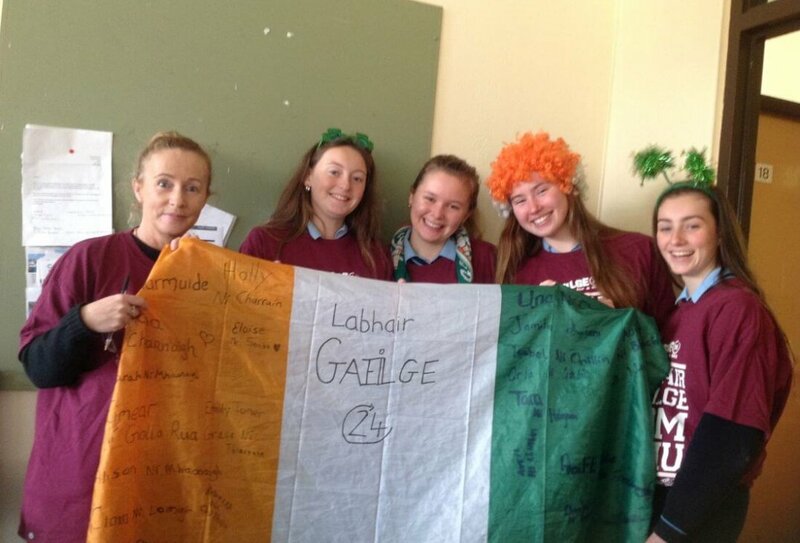 Comhghairdeas do lucht na Gaeilge sa Choláiste! Go neirí libh an Ghaeilge a spreagadh sa scoil agus an Gaelbhratach a fháil. Is fiú agus is féidir!